Happy Monday Everyone! I have the privileged of hosting one of the stops in The Summer of No Regrets Blog Tour. Katherine Grace Bond is here today to discuss the phenomena that is fame and why we crave it. Take it from here, Katherine! "When I first started writing THE SUMMER OF NO REGRETS, I didn’t want to admit how much that idea intrigued me. I’m a lot like my main character, Brigitta—all about finding the meaning of life, not fantasizing over whether the guy next door is a movie star. When I bought a National Enquirer, I explained to the grocery store clerk that it was for research— that I was writing a book (“Yes,” I told her modestly, “I am an author.”) I certainly didn’t normally read that sort of thing. Of course not. Well, okay, maybe the headlines. Occasionally. But as I read through stacks of People and Star and Us (which is a lot like eating sugar cubes all day long), and more stacks of celebrity biographies, I started to wonder what the deal is about fame. Why does it fascinate us? Why do we love the idea of either being famous or being connected to somebody famous? I think it’s because we’ve got some interesting ideas about “being known.” If I’m “known,” people know who I am, right? Lots of people. Those people will say I’m talented and beautiful and they’ll treat me with special respect. If I’m known, I get to wear amazing clothes and ride in limousines. People will do what I want just because I’m known. If I only eat the green M&M’s, someone will pick those out of the five-pound bag and put them into a crystal dish for me. If I’m known, I am important—more important than that boss who fired me, or the teacher who gave me a C and said “You ought to be ashamed of yourself,” or the security guard who threw me out of a mall in Seattle for plugging my cellphone into a floor outlet (true story!). But is that really what being known is? Getting special treatment and being better than somebody else? Who really knows me when I’m known like that? What I crave, what I really crave, is to have a few people who will look into my eyes and know me—know how I wrinkle my nose when I laugh, and what my favorite show is, and why I’m afraid of guns. It’s what we all want, I think—people who will listen to us when we’re scared, and scream with us on the roller coaster, and trust us with their hurts. We want to know we matter. We want to have a few people we don’t have to hide ourselves from. So is Brigitta’s next-door-neighbor a secret superstar? We can talk about that later. I need to go to the grocery store and read some headlines." Katherine, thank you so much for taking the time to write a guest post. And now, it's giveaway time. 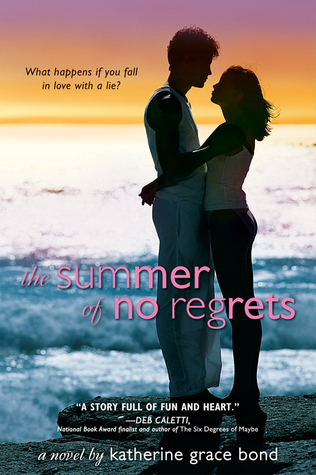 Courtesy of Sourcebooks, I am giving away a copy of The Summer of No Regrets to one lucky winner. All you have to do is fill out the Rafflecopter form below. This giveaway is only open to US and CA participants and will end May 31st at 11:59 CST. I've been loving the spotlight on this author. I haven't read anything by her yet, but the reviews for this have made me really curious. Sounds great! Ugh! It seems like I've been waiting forever for this book!! Can't wait to read it! I have been dying to read this book since I first saw the cover. Fame is a funny thing and we do to see a famous person is so crazy! I can't wait to read this book and see what happens when you fall in love with someone famous. This book sounds fabulous! Can't wait to read it. I think we all have a bit of that guilty-pleasure thing when it comes to celebrity-watching. I love reading all the headlines on the gossip magazines in the grocery store lines. It's a momentary escape from reality! Thanks, Katherine, for an entertaining and intriguing post! You've made the book even more enticing for me! Sounds like a wonderful summertime read! Thanks for the giveaway! Congratulations of your publication! It looks like a great read! I hope Rafflecopter picks me! I love the idea behind this book and have been interested in reading it since I first read the summary. Such a fantasy to fall for someone famous. I love that you had to justify to the clerk when buying the magazine. I probably would have died to buy it or sent someone else to do it for me. Can you use the self checkout for that??? I love summer theme books they are perfect to take with you on long road trips and add adventure to your trip. You make a good point--I, too, would much rather be known by people who REALLY know me than be known just for my name or face. That was a really interesting point. As I get older I also think that fame, and being fame adjacent has something do do with being remembered. So many of us will go through life without leaving any kind of mark on this world, except for those few people who really know us, if you are famous you will leave more of a mark. Interesting because I think people always try to find the "meaning of life". We've all made choices we are proud of and choices that we regret in life. What makes the book more appealing to me is in the title itself, "The Summer of NO REGRETS". I think "fame" is fascinating to those who look for it because of the "attention" and "satisfaction" we can get from it. I look forward to reading this book. this book sound really good. I love summer books. I am excited to read this book because it sounds interesting. I'm excited to read The Summer of No Regrets because well I love the cover! and because i've been hearing amazing things about it!! I absolutely LOVE the cover!! And the plot sounds intriguing. I have heard many great things about The Summer of No Regrets and I am just incredibly anxious to get my hands on it! It sounds amazing, the plot is intriguing, and just the cover+title looks awesome!! I hadn't heard of your book, but I'll look out for it. I'd love to have a new book for the summer! I NEED to read more. I have a hard time relaxing, due to a very stressful job. I enjoy the guest blog and all the items here. Thanks. Have a great Memorial Day Weekend. This looks like a fun summer read. Definitely adding it to my TBR.